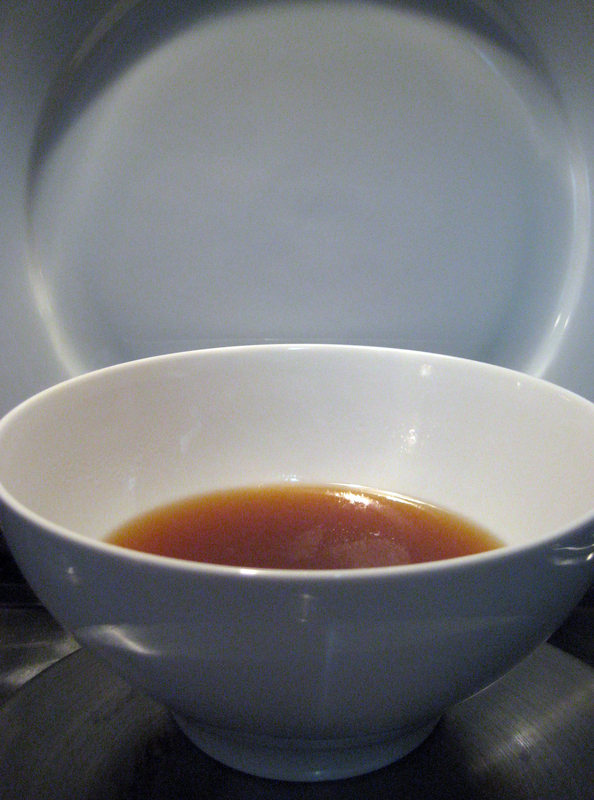 How do I love broth? Let me count the ways. So versatile and so flexible an ingredient, it’s surprising that broth should be so UN-intimidating, so simple to concoct once you get the hang of it. After all, it’s water and flavorings simmered together for a nice long party in the hot tub, nothing more really. I’m extraordinarily simplistic when it comes to broth: if it ain’t easy to brew and full of tasty smooth liquid-gold goodness when it’s done, it ain’t gettin’ made in my kitchen. It ought to have a nice dose of nutrients beaming out of its depths as well, but I’m not getting any meters and test strips and laboratory lunacy involved to prove my point; if the ease is easy enough and the soup is slurpy enough, my litmus test is satisfied. Every time I slide the old slow cooker off its shelf and out to start the party going, I clutch at my heart to still the palpitations of happy-tude. Because somewhere along the line, this kitchen commitment-phobe who dreaded attempting to prepare anything that looked complicated and fussy and mysterious discovered that while a good broth may require a certain amount of attention and a couple of brief periods of semi-assiduous activity over a couple of days (! ), it doesn’t have to be scary and impossible, even for me. And hooray, it doesn’t have to follow a persnickety recipe full of esoteric ingredients either. 1 – Don’t think too hard. The more I muck about with a Plan in the kitchen for anything, the more I tend to want to give up. 2 – Use good ingredients. Don’t cook with anything you wouldn’t be willing to eat as nearly unadulterated on its own as is safe or any booze or juice you wouldn’t be caught drinking on purpose. That age-old wisdom is handed down from the earliest generations of cooks precisely because it’s True and it works. 3 – Choose tools that work the way you want them to and keep the techniques as uncomplicated as possible. Good broth can be made without much real skill, I’ve learned, so don’t go and make it more daunting than necessary. 4 – Let the ingredients, tools and time do the work for you as much as possible. 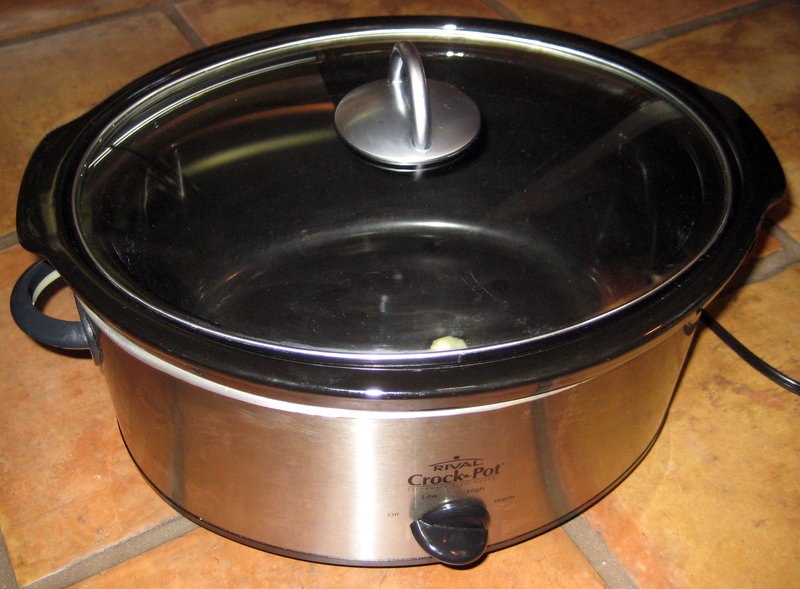 I use a Crock-Pot®, because it’s the slow cooker I happen to have and I like it. I’ve had it for about a decade and it puts up with all of my kitchen monkeyshines without breaking a sweat. Okay, that’s a complete fib: slow cookers tend to “sweat” profusely inside; it’s part of what they’re designed to do. Mine has a see-through (except for that condensation) glass lid and a removable stoneware lining that lets me soak all of the evidence away after whatever I’ve wrought in my cooking frenzies. The rest of my broth-making arsenal is basic as can be. My 10×14″ Pyrex® casserole baking dish (not seen here–it was in use elsewhere during today’s modeling photo-shoot) to put bones and/or vegetables in for roasting before the big simmer starts. Tongs and a sturdy spoon for tending and fishing around in the broth contents once in a while if needed, and a sturdy cooking spider (this 6″ diameter baby works great for my purposes). 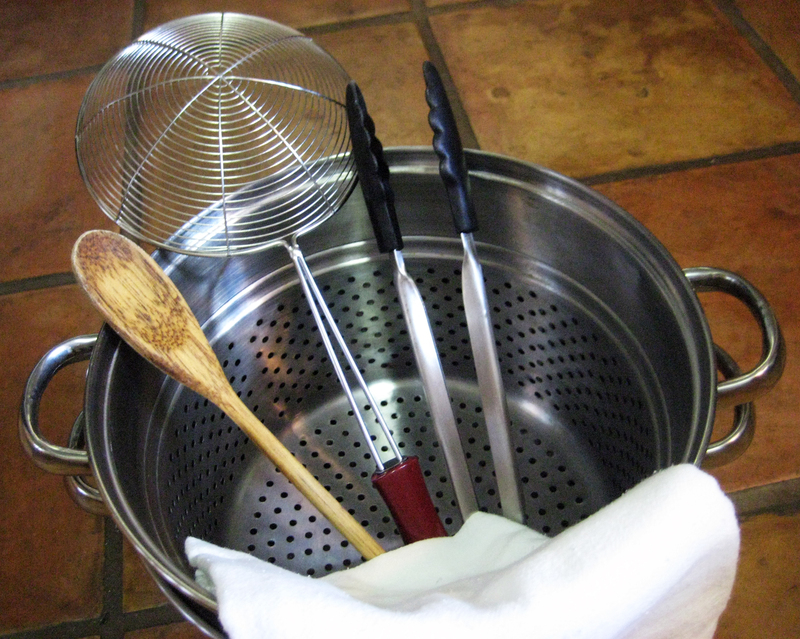 Our old pasta strainer cook pot, lined with a flour sack dish towel, is the perfect way to finish the broth straining once the cookery is done. The ingredients of my broth parties are variable. A basic vegetable broth from my kitchen is likely to be nothing more complex than the classic aromatic combination of carrots, celery and onion, with seasonings dictated by my mood and the intended uses of the broth (mmmm, shall I go southeast Asian this time? Head for something more Spanish and gently tuck in some saffron at the end? Throw in some fruit?). Seafood broth starts with the same aromatics and gets whatever shellfish parts–yay, I get to say exoskeletons, because it’s correct and such a cool word!–I can get my paws on thrown in along with the available vegetal treats. I’m not entirely open-minded when it comes to the veg that gets added to broth blends, because there are some (cruciferous culprits, I’m looking at YOU, for example) that will take over the pot the minute they get a chance and you won’t taste anything else. No matter how much I like broccoli, I’m saving it for Cream of Broccoli soup where it can show off all it wants without being a pest, but otherwise I’m a segregationist lest there be a liquid coup d’état. Roasting almost anything before simmering it in liquids, thanks to the ethereal effects of caramelization or Maillard reaction, is a great way to enrich and intensify the flavors of the brew, so if there’s time to do a medium-heat roast beforehand, it’s always a dandy addition. And since that process is so ridiculously simple, it’s one there’s no reason to avoid. How I roast this stuff: scatter coarse chunks of tasty ingredients in a big flat pan (the aforementioned Pyrex, in my house), season them with a light sprinkling of good salt and black pepper and a spritz of some delicious fat (coconut oil, olive oil, butter, lard, bacon drippings–whatever the mood requires that happens to be on hand), and stick it all in the oven at around 350 degrees Fahrenheit until it smells irresistible and looks as pretty as a roasted-goodies picture should look. What to roast: aromatic vegetables, root vegetables, sturdy mushrooms, and/or any protein supplements headed for the pot. That shellfish armor, some hunks of not-very-tender meat or just bones from the same birds or beasts that are destined to be the centerpiece–they can all benefit from a bout in the tanning bed. If some of it browns nicely before the rest, pull it out earlier and throw into the cauldron to get a head start simmering. All of this takes far longer to tell than it does to do. So. Pre-roast whatever you want browned. Then you load up the slow cooker with the browned goods, vegetal parts, and seasonings, cover it all with water and/or white wine (red almost always overpowers the flavor too much for mere broth), throw in another knob of butter or other fat if so moved. Me, I’m almost always moved to add fats, okay? Then Let. It. Cook. No need to fiddle with it again for a very long time. I usually let my broth simmer for a whole twenty-four hours and get all of the flavor and life I can out of the meat, bones, vegetables and seasonings I’ve corralled in my concoction. Dedicated vegetarians, I accept your choice, but please allow me to differ; while I relish good vegetarian dishes any time, I also respect and admire quality seafood, poultry and meats that are simmered down to their essences in broth. 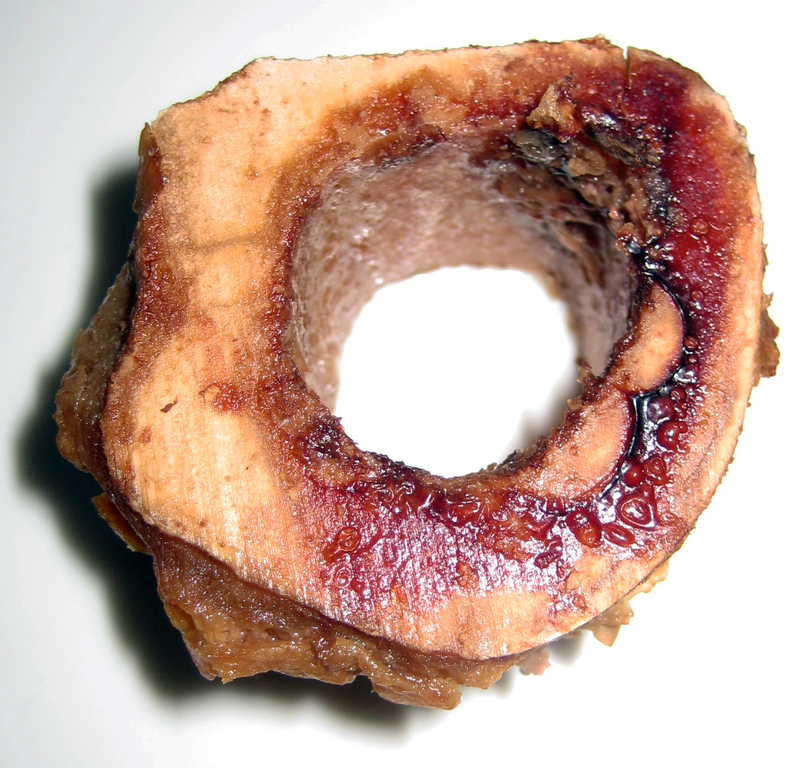 I cook mine so intently–but not, I insist, intensely, as that would kill their flavor and defeat the purpose of this slow ritual–that often the heaviest beef bone in the pot will break into several pieces when I begin the straining process by shoveling out the solids with my spider. Waste not; taste’s in the pot. I cannot emphasize enough how little it matters to me to do the constant-skimming, water-changing, pot-cosseting stuff that I’m sure has perfectly meaningful and scientific reasons for being done by so many expert chefs. I can’t be bothered, because when I finally do strain out my broth and let it cool and chill it overnight and pull off the fat cap, I haven’t got any leftover grunge I won’t happily glug down plain or in a recipe. I have clear, rich, smiling, shimmering soup stuff that straight out of the fridge wiggles like a happy dashboard hula doll from all of the natural gelatin in it, soup that has rich, deep flavor from the roasting and the combination of delectable ingredients, and especially from the long sensual spa treatment melding it all together, and that I personally think has benefited greatly from not being pestered or treated with distrust. I’m not above poking the spoon in about once every two hours during daylight to slightly rearrange the parts and just make sure everyone gets an equal soak, not to mention to let a little of that intoxicating steam float around the house, but otherwise I’m all about letting the low heat and long time do their thing without interference from moi. Yellow onion, skin and all. Sweet onions are too soulless for soup. Sorry, sweet onions! Carrots and celery, washed but not peeled or trimmed. Beef: shanks, oxtail, short ribs, marrow bones, and all of the trimmings from steak dinners that got set aside in the freezer for Broth Day. Chicken: the picked carcass of last week’s roast chicken, plus a piece of fried chicken that didn’t get et at the picnic on Saturday, also all rescued from freezer purgatory. Beef and poultry are great as soloists, but together they rock the house. Just sayin’. A small palm-full of black peppercorns, several good bay leaves, a big sprig of thyme, about a half-dozen whole cloves and a half-teaspoon or so of whole allspice. Sometimes a stick of whole cinnamon. I never add salt at this phase, since the roasted stuff was lightly salted, the meats were seasoned for their previous meals, I don’t (yes, I confess it right here in front of God and everybody) bother to use unsalted butter, and I concentrate this brew all too well to get anything but seawater if I’m adding further salt incautiously. Lop everything into approximately 2″ rough hunks. Neatness doesn’t count. Fill the cooker loosely up to the max-fill mark and then fill in the nooks and crannies with liquid. Set it a-simmer and wait for the angels to come and alight on the kitchen counter in anticipation of the unveiling lo these many hours later. This entry was posted in Food, Happiness and tagged Broth, Cook, Food, Roasting, Slow cooker, Vegetable by kathryningrid. Bookmark the permalink. Mmm…totally condensed goodness. I don’t have a slow cooker but I love making chicken stock from the left over carcass, seeing it simmering away on top of the cooker is good and is’s very satisfying knowing there are batches of it in the freezer. I was just thinking that it’s been a few batches here since any of it actually got as far as the freezer–having Mom and Dad S visiting for a couple of weeks has changed the use rate a little, I guess! 🙂 But I’ve been known to do the cook-top variety too, just got lazy when I learned how little tending the slow cooker demands. My other favorite, when I do a REALLY big batch, is to put the slow cooker on and pop the other half into my dutch oven on low heat; the oven here isn’t exactly accurate but does keep a *steady* temperature once I find the one I want! I’ve decided a few ambient fat molecules drifting around the house also helps knock down the visibly floating dust. 😀 But yes, the smell of home brew of any sort beats the socks off of Room Fresheners!! As good as that all sounds, i have a small suggestion, cus its what I do, add a little (probably 1/2 to 1 tsp) of cumin, not overpowering, i like how it interacts with the allspice..at one point i actually made 2 batches side-by-side to prove to myself the difference in the goodness. I think you might enjoy this. Try it & let me know what you think!!! Oh, yessirree! There’s hardly *anything* that isn’t further yummified by the addition of cumin! I do add it when making things with the already made broth. I tend to make large enough batches for a large enough variety of dishes that I make the soupy stuff generic most of the time and save the groovy special flavors for the groovy special dishes. But yes indeedy, I do agree cumin’s a beautiful addition. Well, grab a soooooooper-long straw, Honey, and you can have all you like!! Better yet, you two head on over here and get some broth in person. 🙂 xoxoxo! Wow that looks like it packs a punch. I make beef stock using a lot of marrows, its so cheap here like $1 for a really big bag. Dear Raymund, you are going to have marrow-lovers fainting with envy!